Several issues arise when a TeX document is to be constructed collaboratively. Your partner(s) may not be used to TeX (ConTeXt) markup. Have the partner construct the document in WYSIWIG software and have them import it to OpenOffice and then export it to TeX. Use third party software to convert between formats (PDF to Word for instance). People can join the effort from anywhere in the world provided they have an internet connection. Editing the document is relatively easy. Folks can visualize the structure of their document in the HTML version. Folks who want to convert the document into WORD just needs to import the HTMLversion. Any Wiki software may just be fine. 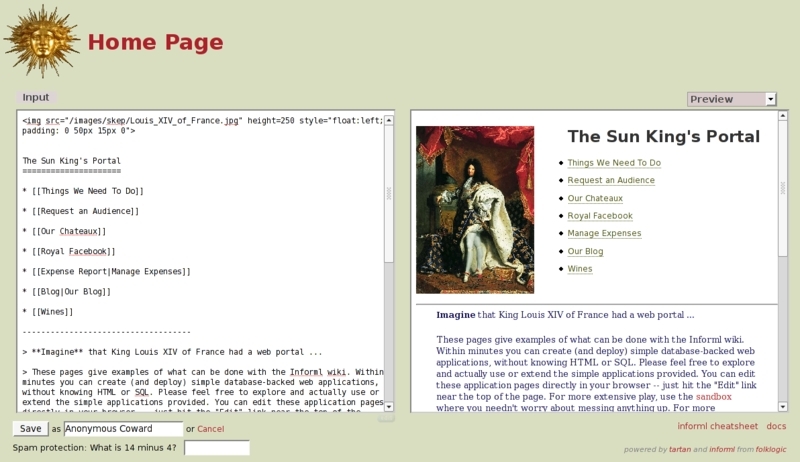 In this document I will use a new Ruby Rails based wiki software known as Informl to illustrate key ideas. One attractive aspect of Informl for my colleagues who are used to WYSIWIG software is that while in edit mode, a real-time preview is available in a twin-window. This page was last edited on 16 July 2007, at 07:58.